When I was a kid, my sister and a few of our friends and I would often walk to the local elementary school on weekends. It had a small playground – nothing fancy, but it was close to all our houses. One of our favorite games was to take turns inventing obstacle courses and seeing who could make it through the fastest. We probably looked crazy to anyone who happened to drive by, but it was fun. The competitive element was only part of it. What we enjoyed most was the challenge of pushing ourselves, regardless of how everyone did, and the fun of creating new courses each time. We would have gone nuts for any of the new Century obstacle course equipment. There’s a ton of variety, and the equipment can easily be set up in a backyard or even inside. Here are a few ideas for building your own obstacle courses for your kids. These are only a few suggestions – the possibilities are only limited by your imagination! 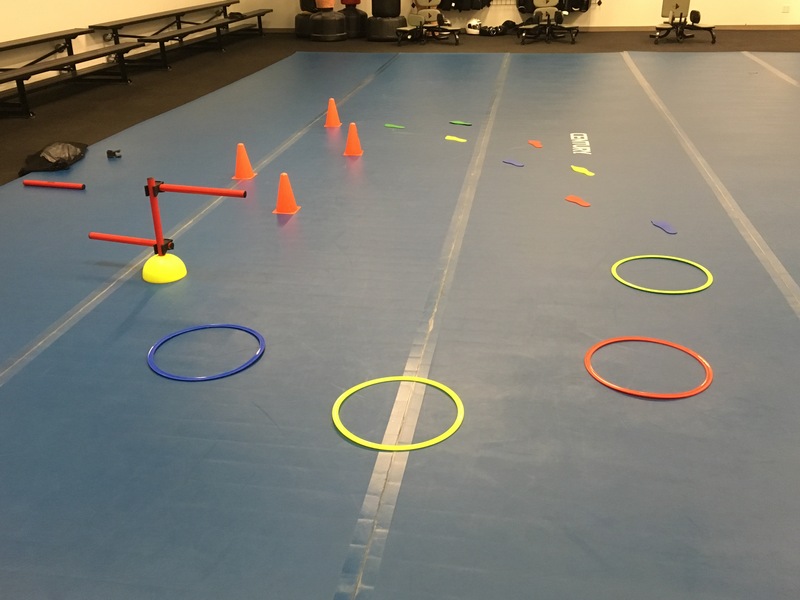 Here’s a basic obstacle course set up the Century training facility. This course forms a loop, so multiple kids could run through at once. They do lunges across the Foot Forms, weave between the cones, jump over the Multi-Jumper (set at two heights), then jump from one foot to the other through the Agility Rings. This simple course took only seconds to set up. As the kids start to pick it up, call out the commands more quickly and make them a little more complex. Don’t forget to call out some instructions without saying Simon Says! If anyone does something without Simon’s permission, they have to go back to the start of the course or are out! You can see who makes it to the end of the course first, or who can stay in the longest without missing a Simon Says instruction. If you have a backyard jungle gym or other play area, add it into the course! This is more of a race-style obstacle course, complete with extra “challenges” along the way. For example, you could set up the 9” Cones in a zig-zag pattern at the start of the course. Kids have to run between them, leap over the Multi-Jumper, climb up the slide and slide back down, jump hopscotch-style along alternating double and single Foot Forms, and run to a tree or fence to finish. The obstacle course can be as long or short as space allows, and you can have them do multiple laps. If a rainy day traps you inside and you don’t want your kids cavorting through the house at full-tilt, build a course that focuses on mental instead of physical challenges. 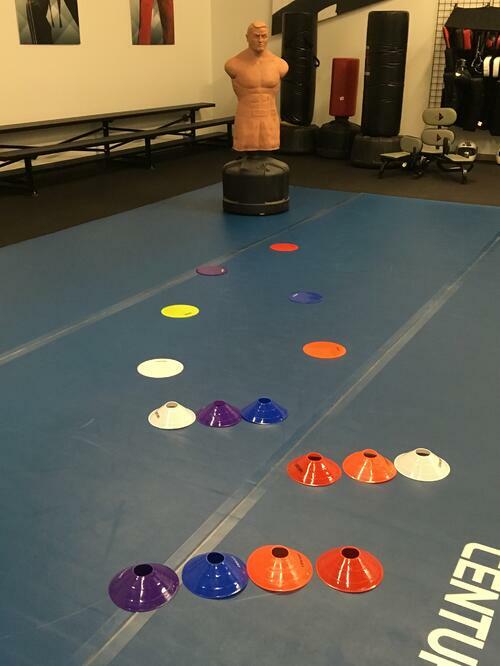 Set up Hand and Foot Forms and other colorful items like Saucer Cones, Agility Dots, and Agility Rings. If you have multiple kids approximately the same age and skill level, or if your kid has friends over, let them take turns walking through the course forming a pattern. For example, they might step into a blue Agility Ring with their left foot, hop onto a white Agility Dot with their right, bend down to touch a green, then blue, Hand Form, then do three jumping jacks to end. The second child then has to go, repeating the pattern as closely as they can. If you only have one child, you can tell them a list of instructions to follow, then let them go to see what they remember. If you have other martial arts equipment on hand, like Hand Targets, Blockers, or even a youth bag, incorporate them into the obstacle course. For example, start the obstacle course at the training bag, and have it end in front of where you stand. First, your kid has to do five kicks to each side. Then they run to the next obstacle, then then next, and so on, until they reach you. You could be holding Hand Targets and call out a series of combinations, or have them block ten strikes from the padded Blocker. After that, they have to run back across the course, completing the obstacles in opposite order, before finishing up with ten more kicks. In this course, kids shuffle back and forth between the lines of cones, hop from one dot to another, kick or punch BOB, then turn around and hop from dot to dot before shuffling through the lines. They are practicing footwork, as well as striking. 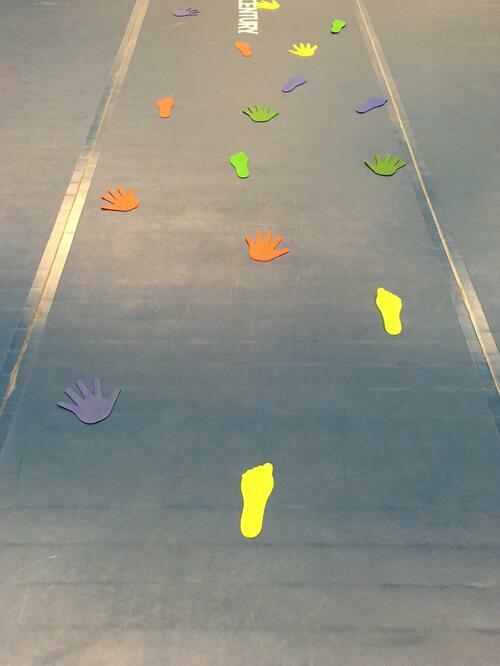 Spread two sets each of Hand and Foot Forms over a wide area of space, forming a scattered path. (Don’t just make a single line of forms, though.) Essentially, you should have a mix of Hand and Foot Forms in a large rectangular space. There should be one or two feet of distance between each form. This obstacle course is not necessarily meant for speed, and focuses on flexibility, concentration, and balance. If it’s too easy for taller kids to step or hop from one Foot Form to the next, make the rule that they can’t move the same foot twice until they’ve moved a hand. For example, they could move a left foot, then right foot, right hand, then right foot, but not go left foot, right foot, left foot, hand. Obstacle courses aren’t just for kids! Let your kids set up an obstacle course for you, and let them time you. Challenge them to make a (fair) course that you can’t beat on your first try. Kids are greatly influenced by their parents, for better or worse, so when they see you participating and enjoying yourself, it will set a positive precedent for when they try new things in the future. Also, you’ll have fun! Remember, these are far from the only options for creating an obstacle course. You can make a course with all of these items, or with just a few you mix-and-match yourself. You can also get Century’s Obstacle Course Kit, which comes with an assortment of items. No matter which way to go, your kids will have a blast. They’ll be getting exercise while practicing skills valuable to martial arts – but they’ll probably be having too much fun to realize it!